…and so the love affair began! I use the dark brown henna from Mountain Rose Herbs — they have so many varieties of henna (Lawsonia inermis) to choose from (click here to check out their selection) — and the whole experience is nothing short of pure goodness. Combined with my usual natural hair care routine (i.e. shampoo bars + vinegar/herbal conditioning rinse) things are super balanced + peaceful. …the idea came to me! 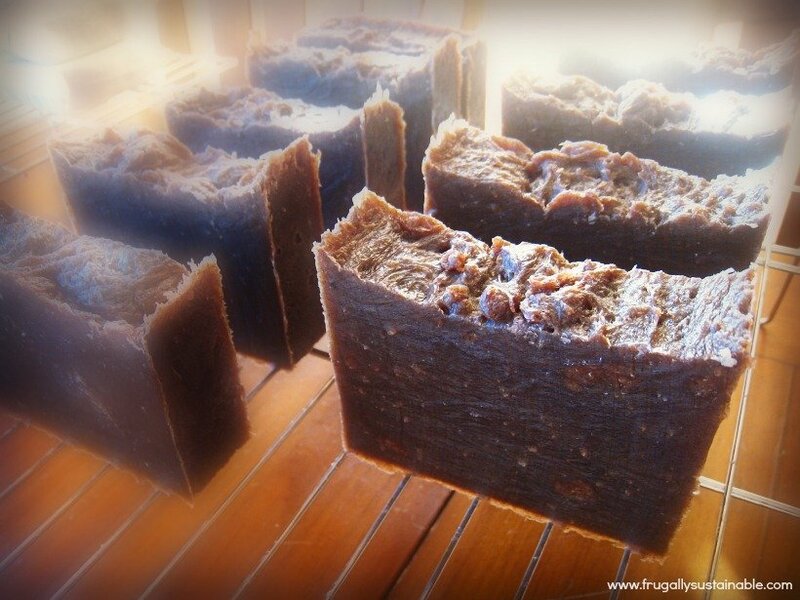 A henna shampoo bar…a universal one…something every hair color could use and benefit from! …we can reap the benefits of henna with every shampoo! 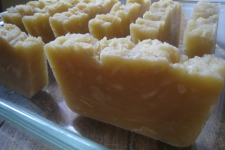 Ingredients*If at all possible, use organic ingredients when creating this shampoo bar. I have linked to the products I personally use as a reference. 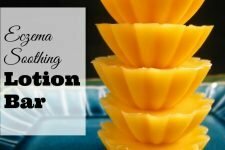 I purchase lye for soap-making online through this reputable source. 1/2-1 ounce essential oil blend of choice, I like a blend of sweet orange, ylang ylang, rosemary, patchouli, lavender, and eucalyptus. Choose what you have on hand, the oil(s) that you are drawn to, and/or those readily available. Carefully combine the lye and water by pouring the lye into the liquid (never pour liquid into the lye) and stir liquid until lye is completely dissolved. The liquid is caustic and not to be touched in any way. The outside of the bowl will be extremely hot as well. Be careful when working with lye and follow all of the recommended precautions. Note: What I’m trying to say is, I can not be held responsible for any craziness, mishaps, explosions, etc. that may happen when making this recipe. Add the silk (if using) to the hot lye solution and stir until dissolved. Measure the oils (withholding the jojoba…we’ll add that later) – by weight – and then place in a large non-reactive stock pot strictly devoted to soap-making (set over the stove) — to melt on low heat. Once melted, add the lye/water mixture to the oils in the stock pot — and stir. Note: Any equipment the lye touches needs to be neutralized in a mixture of white vinegar, soap, and water. Continue stirring and blending for 2-3 minutes more – until the mixture becomes a thick, pudding like consistency. Once the mixture is pudding-like, add the powdered henna + herbs and stir well to combine. Cover the stock pot and “cook” the soap, on low heat, for approximately 1 hour (the soap should be somewhat translucent). Prepare your mold. Note: I use these silicon loaf pans and absolutely LOVE them! This recipe is enough to fill one of these molds. Once the soap is done “cooking” remove from heat allow to cool on the counter for 3-5 minutes before adding the jojoba oil and essential oils (if using). Spoon soap mixture into mold. 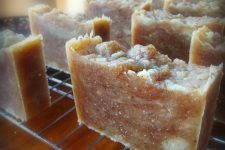 Place bars on a tray with good airflow so that they can harden further (I use these super inexpensive cooling racks to dry my soap). ***Because this is a hot processed soap…these shampoo bars are ready to use 24 hours after cutting. -I’m telling you, this is the most amazing natural hair product I have used! My hair is so shiny, soft, and manageable. -When showering, be sure to complete the use of this shampoo bar soap with a 1 part apple cider vinegar and 3 part water conditioning hair rinse. I like to put this in a spray bottle and spray my hair with it just prior to leaving the shower. I do not rinse it out (more conditioning that way). The smell of vinegar will dissipate once the hair dries. Chances are…if shampoo bars haven’t worked well for you in the past, it has everything to do with your water quality! I have super hard water here in Phoenix and I have changed my shower head to this awesome filter that removes all the heavy minerals. I couldn’t be without it! I was wondering why you add marshmallow root powder? What natural remedies would you recommend for itchy scalp (no dandruff present)? I’m confused, years ago henna was considered bad for the hair because it built up on the hair, often changing color, and you could not remove it. Is that no longer true? Henna has become a very popular ayurvedic hair treatment. You can find several types that will color your hair, but you can also find colorless henna which will give you all the awesome benefits without worrying about the color change on your hair. Henna is a popular natural hair colorant. I worked in a salon for years and had seen many women destroy their hair color with henna though, so it’s just a matter of knowing what you are doing and personal preferences. When used right, henna is a pretty cool addition to hair care. I usually wash my hair with baking soda and then an infused ACV conditioning rinse. If I wanted to use henna, would you suggest putting henna in my ACV rinse? Can I replace the kokum butter with something else? I’ve never used kokum butter, really hard to get over here. Cheers ! What would happen if you replaced the colorless henna with a colored one? Do you think it would tint the hair gently over time? I would TOTALLY buy a red tinted bar from you! A lot of soapers (like myself) use the colorless henna to sub for the color ones. You still get all the awesome benefits of the henna without worrying about henna coloring your hair. The colorless henna shouldn’t give you any visible color tint or change. Looking forward to your new creations!